I hope you are having an amazing 3 day weekend! Our Saturday was a BUSY one! We had Reagan’s dress rehearsal and recital for ballet. She did awesome and I am SO proud. I will share all of the pics and hopefully a video of her performance, tomorrow! But, today, I have something SO exciting for you!!! You know about my love for Hayden Reis tote bags. They are seriously ahhhmazing. I am a huge tote bag person…I have more than I care to admit. These totes!!! These totes take the cake. They are life changing. They are made of sailcloth which means, they can get wet. You can rinse them out…with a hose! That is HUGE! You can even wipe them with lysol wipes. Yes, I know because I have done it, numerous times! I mean, seriously! So awesome!!! You can check out my summer essentials post that included a Hayden Reis tote, here. This tote will be accompanying me and the fam bam to the pool and beach all summer long! Plus, they are HUGE! You can fit a lot in them! Or just your basic pool and beach essentials (I have 4 full sized beach towels in here, thermoses and extra clothes for the whole fam!)! The point is…they are large and in charge and FAB and YOU need one! So, to get you prepped and ready for summer, we are giving away, one of Hayden Reis’ Ditty Totes. This is my favorite one of their totes and I am SO excited that one of you have the opportunity to win ONE!!!! They come in all sorts of FAB colors, so the winner gets to pick their favorite! How fun is that?! All you need to do is enter, using the Rafflecopter below and be sure to comment and tell me what you would put inside your Ditty Tote if you win! Omg I would love the large lucky stripe bag. Perfect for keeping all our newborns stuff together for trips!!! This tote would be perfect for my Upcoming trip July 4th to the Riviera Maya in Mexico! What a great way to show off this awesome bag at the beach and at the airports. Not to mention what a great 7th anniversary present it would be 7-7-4! I love big bags and I cannot lie! 🙂 I would use this cute bag for everything from beach/lake essentials to the gym. I would use this tote to carry all my stuff for pt school! Love these!! Such a great tote! I would love to take it to the pool with all of our stuff for my fam! I would definitely use the tote for beach essentials: towels, changes of clothes, sunscreen, snacks,etc. Love the pink and orange one! Or the yellow and blue one..I can’t decide! I’d fill that tote with all our pool essentials…towels, snacks, clothes, etc. Love your blog! I would love the Bermuda pink and coral bag. With 2 little girls 2 and under, I have no shortage of things to fill this cute bag up with or places to take it! this would be great for bringing the girls to the pool all summer long. Towels, toys, snacks, everything would fit! I’ve been searching for the perfect pool bag. My 4-year old starts school (for the first time!) in the fall and on her “must do this summer!” List is to go the pool…a lot!! I would use this tote for all of the essentials for a pool day! I would use my Hayden Reis bag for all our pool goodies! Love this tote (especially the flamingo!)! Perfect for pool days with two little ones – towels, sunscreen, hats, snacks, and more would be going along! I would love to use this as a beach bag for all my upcoming trips! This would most definitely be my new pool bag! I’ve been using a costco tote for 2 years and desperately need a new one! This one is super cute and seems to have tons of space!! I’d love this for the beach! Goggles, towels, sunscreen…all the pool necessities for 3 kiddos! And a book for me! Beach toys! I always need an extra bag just for the toys and this would be great since you can spray it out when you’re done! For all my boating essentials! Oh my gosh how nice! I would use this tote for our beach and adventure escapes all summer. It looks perfect and I would love the opportunity to use it and remember you fondly! Thanks Fancy Ashley! I think the ditty tote is adorable! We have a pool so it would be great to use to carry snacks and all the pool essentials in one trip out to the pool. I would love this bag for the pool! My favorite definitely is the one that sweet reagan is standing in! LOVE THE FUN COLORS! THIS WOULD BE THE PERFECT SUMMER BAG! Love these bags so much! I would fill it with all the pool and beach essentials my 3 year old daughter needs. And that of course is multiple outfit changes, sunglasses, and towels with her name on them! I would put swim items in my tote….or extra clothes/sweatshirts for a campfire party….or a packed lunch for a trip to the park….the possibilities are endless! This bags are great! I would actually use mine as a work bag. i work at the hospital in the er and it would be great to have a big bag to put my stuff in that i can wipe down at end of day! With a new little one on the way, I would fill my tote up with all the things he would need. Word on the street is that I’ll be needing a good tote :). I have been lusting over these bags!! I would of course use for our pool/beach adventures all summer long but with the bag being made of sailcloth picnics and park trips would be on the list as well!! Thanks so much Ashley for the wonderful opportunity! !and hayden Reis as well!! I love the flamingo or royal blue stripe! Super cute and super functional bag! I would love this bag for pool season! This tote calls for the beach essentials – towel, lotions, insulated bag for chilled drinks, a good book, baby powder to clean the sand off, a pop up shade screen, and my 4 lb teacup Yorkie. Won’t.we look cute? This tote would be amazing for beach/pool days with my 2 little girls!!! I love the flamingo bag…my 2.5 year old is obsessed! I would load it up with all of my beach and pool essentials, especially sunscreen and something to read. I would fill it up with all of our beach gear for our upcoming trip to Destin, Fl!!!! I absolutely love these totes and would really love to have one! I can see it full of towels and magazines, heading to the lake. Plus, my daughter’s name is Hayden, so it’s my favorite (and a family) name! thanks! What wouldn’t I put in there?!? I’m a bag addict too, I need this bag! that this student loved and made note. to carry my books, computer, gym clothes, and travel size bingo! This bag is perfect, and even matches my pink coat! This bag would be perfect for all of the river and beach trips we have planned this summer! SO CUTE!! This would be perfect to stuff all 3 of my kiddos beach essentials in. The best part is not worrying about it getting dirty since it’s so easy to clean! I LOVE that flamingo one that Reagan is sporting!!!! I’d totally take that with me on my 30th bday trip to Cabo!!!! I would use the tote for going to the pool and beach! The ditty bag looks fabulous! Loving the Tahitian blue stripe bag – perfect for those summer outings with a preschooler when you need to take everything they may need! Love love love!! I’m a bag-aholic. Can’t wait to use this for my beach vaca!! I would take this bad boy to the pool all summer!! I love them all!! So bright and cheerful! The flamingo is cuuute! I would love to use this as my summer pool/beach bag. it would be perfect for carrying towels, magazines, books and some cocktails! it would also be perfect to use as a weekend bag for a quick trip! I love all of the totes! One would be perfect for my beach vacation in July! I love the yellow and blue especially with a fabulous monogram! I will fit it up all summer with mine and the hubs stuff! I would put anything from pool accessories to family get away accessories 🙂 or a night out . Love the tote with the purple stripes – and what wouldn’t I put in it. With 4 kiddos I can use every bit of space I can! I love a good tote! I would fill it with pool essentials all summer long! I would fill it with all the essentials for summer + more! I love love love totes and the bigger the better!!! I would fill my bag with everything my kids and I would need for the pool or beach…towels, sunscreen, toys, and just everything 🙂 It is perfect and I would love to win this! Thank you for the opportunity! I love how cute and functional this bag is! Perfect for taking all of your essentials for a day out on the boat! Oh I love the flamingo bag!! and I would probably use it for a pool bag, gym bag, weekend bag, and anything else i could think of because i would want to tote it everywhere! The mint one with the flamingo! I have wanted that one since last summer. It’s so cute and I’ve heard they’re amazing bags. Oh and I’d fill it with our towels and water and some fun beach toys for the kiddos! I LOVE the lilac and grey bag! It would be perfect for our family lake trips, beach trips and everything else! I love bags and the fact you can just wipe this off is fantastic! I would tote all my beach essentials! This tote would be perfect for carrying all of my kids essentials to the pool & beach!! 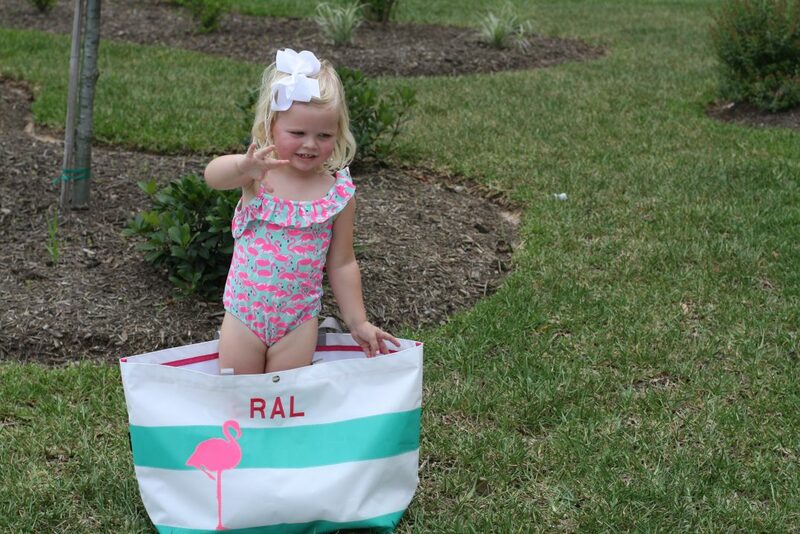 I would definitely use that tote for trips to the pool with my little one this summer! I would choose the camo. I’m a mama to two rowdy little boys who play baseball. This would be perfect for our fishing trips, baseball games, and over night g parent trips! Thanks for the opportunity to win this fab bag. I would fill this tote with popcorn, goggles, towels, sunscreen, water for the pool! Love them all! On day 10 of stomach bug and desperately need a trip to the pool!!! I’d pack up my two babies and get outta this house as fast as I could!!! I love the lilac and grey–so cute although it was hard to pick a favorite! Plus I love anything with a monogram! I would use it as my everything carryall. I plan to go to the pool and lake as much as I can this summer! Or as a toy bag when I’m nannying 🙂 love your blog and love these totes, I’ve been eyeing them for awhile so I’m excited about this giveaway! I would love to win the flamingo bag!! Heading to the beach I would fill it with all the essentials!! I would use it for a beach bag!!! You are awesome!! What a fun giveaway! Currently looking for a bag just like this one! I love the flamingo one! I have been looking at these bags a lot lately but haven’t been able to go for it! I love the orange and pink striped bag and the gray and purple striped one. We live away from family right now (military) but are going to the beach with everyone this summer and this would be so perfect for all the stuff a 1 year old and we need! Love these totes!!!! I would use it as a beach/pool bag for my girl’s! Absolutely love a good tote! This would be perfect for hauling sunscreen, summer reads, towels and snacks down to the beach. I will be the fanciest mama on 83rd street beach in Stone Harbor this summer! these are so cute!! i’m in love with the flamingo one! This tote is perfect for all the beach and lake days this summer! This looks like an amazing bag! In attempt to be an awesome babysitter with four kiddos to look after and lots more friends joining along the way, this would be great for the constant trips to the beach and pool all summer! Perfect bag for our SoCal summers! It would be the perfect beach bag for our crew! I have 3 littles 4 and under! Love this bag!! Perfect for beach trips or family outings! I would love to win the precious mingo tote!! Perfect for towels and sunscreen and drinks, oh my! Love the flamingo tote! I’d put of my daughter beach or pool essentials for fun summer weekend. this would be perfect for my upcoming trips to the Bahamas and Daytona beach, Florida!! I would use it for all of my beach essentials! So cute! I am an infant teacher in NYC and this tote would be so wonderful for my classrooms things on our daily walks to the park! The flamingo ditty would be a huge hit with my animal loving crew. I would use it for my girls swimming lessons bag. I love the flamingo print!! I would love to win! We live at the beach and pool during the summer so a tote would come in handy. I would love the flamingo bag! After I got it filled with plenty of boring mommy stuff (towels, sunscreen, towel clips, h2o, etc.) it would probably get filled with cars, dump trucks, balloons, a cookie or 2, and possibly a tiny cat statue by my 2 1/2 yo son, Reed! Thanks for the giveaway! I love this bag! It would be great for the pool and hopefully the beach if I can get there! Everything currently in my diaper bag plus a few towels and books for the pool and maybe a few cold drinks that I can sip while I sit in the sun as my husband watches my daughter!!! Need one so badly for this summer!!! I would love to say I’d fill it with a bottle of wine sun glasses and a good book with my beach towel and beach necessities but it will likely be filled with diapers, sippy cups, snacks and floaties!!! So cute! Perfect for swim lessons this summer! Love love love these bags! Would love to win one for the beach. This tote would be perfect for our summer beach trip! It looks big enough to fit everything we need. I would love this for carrying all of our summer fun supplies for my three kiddos and mom and dad too!! I would love to take the crystal blue and Tahitian teal bag to the beach!! I love the whale berry pink & teal for summer – so cute! I’d use it to take Towels, snacks, drinks & my iphone to the pool and on all of our summer adventures! 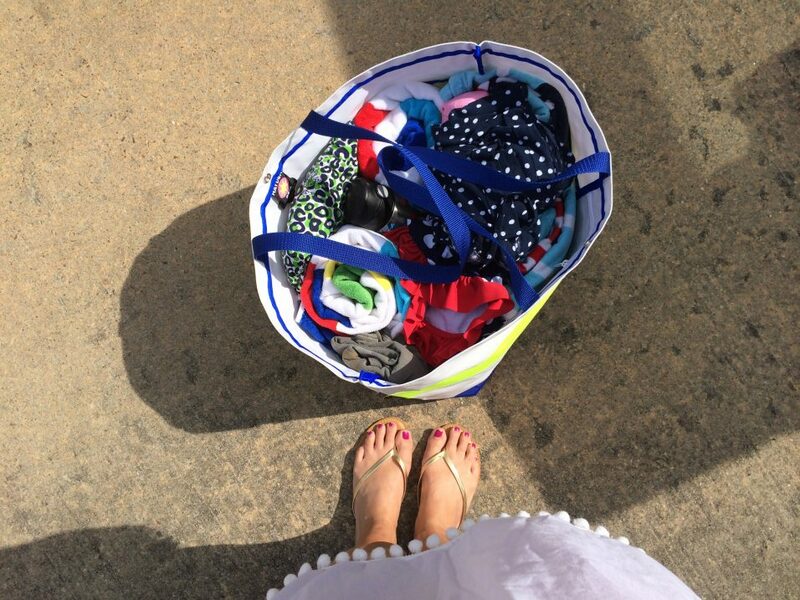 Towels, sunscreen, books, pb &js, Sofia, sunglasses, flip flops, lipgloss, barbies, and trucks…. You know, just beach/pool essentials!! Ps.. I never win anything, but I love this tote. I would love to be able to use this bag for hauling all my kindergarten teaching stuff back and forth, and then for the pool in the summer! Love these totes! I totally need one for our summer adventures. My favorite is the Bermuda pink & Oahu orange. I would fill it with beach towels, sunscreen, water, snacks…and of course some Ninja Turtles & baby dolls!! Thanks for the opportunity at an awesome giveaway! This is perfect for all those last minute, weekend trips this summer! I can just throw everything in & go! Love it!! Love love love these bags!!! I would use it all summer long for our pool and beach necessities!! My fave has to be the palm beach!! I love 20mins away and it would be the best beach tote for my fam of 4!! Love the bag with the flamingo! Would carry it everywhere! I’ve had my eye on the Palm beach lately tote! I love that one! Perfect bag for bringing our 6 month old to the pool and the beach! 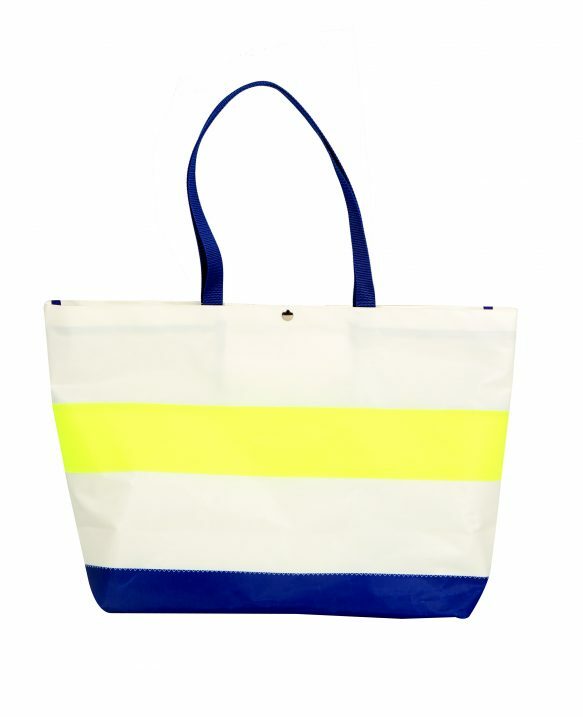 This is the perfect beach tote! As a mom I feel like a crazy bag lady toting all the necessities but this bag looks like it holds a ton! This bag is ahhh-amazing!!! The cuteness of it stands out and it can hold of my sweet baby boys pool/beach goodies!! Hats, toys, towels, sunscreen and so much more!!!! I would fill it with all of our pool stuff. What a great giveaway! Would love this tote for trips to the beach this summer. With two toddlers, a bag that I can easily clean is a must! I would put beach towels, books, sunscreen, snacks, and a ponytail holder in the bag!! And I can’t decide which one I would pick– I love them all!! Super cute!! Love the anchor and flamingo totes!! I would fill it with towels, snacks and clothes for a day at the pool!! I love this bag! I would use it for our pool bag for sure! The large pink & coral tote or the seahorse for sure to fill with weekend or beach getaway stuff! I LOVE the seahorse bag!! I really like the Let’s go fishing leather bag too! These totes are so cute! I would love to fill one with towels and sunscreen for the pool and beach! This would definitely be able to hold everything for my 3 kiddos! Between baseball games, gymnastics and the pool I’ll need A big bag for it all. This bag will be perfect. I love the blue yellow and white bag. The fact that you can literally hose it out sold me!! Love that you’re giving one away!! Great giveaway!! Cheers to me winning one!! I would get the “Palm Beach Lately”. I am pregnant with my first and would love it for next summer when the baby is 6 months old. I would take all the pool/beach toys, sunscreen and snacks!!! I would love this bag for my summer of nannying! And of course it’s perfect for any and all pool and beach adventures! Oh how I would love to replace my ugly beach bag with one of these beauties! With two littles I could pack all the must haves – snacks, extra clothes, etc. plus a few magazines for mama 🙂 such a fab giveaway! I’d use the Lido Lilac & Tahitian Teal and get my soon to be new monogram on it. It would be just perfect for carrying my pool stuff to my parents or to our friends boats & lake houses. Love the black and white striped – with a monogram of course! This tote would be perfect for summer trips to our family lake house! I am already imagining how nice it would be to fit everything into one, gorgeous tote, instead of 5! Love these bags especially the pink and coral one! I’m expecting a baby #3 any day now and would love to win this for our neighborhood pool trips! Thanks for the opportunity, just love your blog! The flamingo design is my favorite! I will be filling it with our family beach essentials! I would love the Seahorse tote to use as a beach/ pool bag! I love how big it is and that it can hold my whole fam’s towels! I would put a case a sofia, my monogrammed beach towel,and toys for #rumpelstiltskinthebulldog!!! I love the bags! With summer coming, I can definitely see me using this for the pool and beach. They would also be good for lugging all the end of the year presents and party supplies to the kids’ school. I’m not sure which is my favorite, but the flamingo is definitely one of them them. I would use this as our beach/diaper bag for the summer, especially since we have a brand new little one this summer. It’d be so nice to just have to haul one bag around this summer And it’d be extra nice if it was super cute & durable like one of these Hayden reis begs! Love the flamingo! Perfect for our trip to destin. This would be perfect for our pool gear… suits, towels, etc. Wow i love all of the different styles and colors on their website! and of course, reagan looks adorable-does she come with the bag 🙂 thanks for the amazing change in the giveaway! Love totes and this one seem perfect for the summer with kids! What a fun opportunity! I would love the mint bag and I would certainly have plenty of sweet little items to fill it with for my one year old Gracie Coue and sweet newborn baby boy Hans so we can head to the beach and enjoy summer! I like the black and white college prepster. Perfect little beach tote. This would be a perfect tote bag to use this summer. Thanks for the giveaway!! I would love to win one. We spend our summers in Miami beach and the flamingo tote would be perfect. Thanks for the chance to win! I would love to win. With a third baby coming any day now this will definitely be helpful this summer for all the fun we have in store! If I won this amazing tote, I will hopefully be filling it with beach essentials for a trip to seaside Oregon for my birthday in August. It’s been a whirlwind year with no vacations and it’s due!!! These bags are so adorable! I love the one with the flamingos! So cute! I would fill my flamingo bag with everything for our trips to the pool! LOVE THESE TOTES! WE SPEND LOTS OF TIME AT THE BEACH, SO I’D LOVE ONE! I love the purple and teal! I would use for everything! Especially packing kids for pool and beach days! I would love to use this during our fall trip to Disney. I could definitely pack some great souvenirs for our three girls in this sweet tote!! My favorite is the Gasparilla gray and Bermuda pink zipper tote. So cute! I would fill it with our towels, clothes, and snacks for the pool! Oh i have always loved this bag! My 2 year old is water obsessed so I’d use it for our many trips to the splash pad and water park this summer 🙂 I’d love the LIDO LILAC & TAHITIAN TEAL bag! love the bermuda pink and coral one!! I’d fill it with snacks and pool items yaaaay!! The LILO lilac and Tahitian teal would be perfect for all our soon to be family of three needs for a day at the lake!! This would be perfect to hold all my beach goodies for my upcoming trip to sea island! Books, magazines and my monogrammed Tervis are a must! I would love to sport the lido lilac and Thatian teal bag at the pool. I would fill it with towels, books, and treats for a day of fun! Thanks for the opportunity to win! I would love to win!! I’ve been drooling over these bags for a few months. I would use mine as a great beach or water park bag, than we are due with baby #2 in October so it would be going to the hospital packed full too! I would love to own one of these bags! The anchor bag may be my fav! I know as many times we visit the beach I am sure to use this bag and fill it with all our eccencials for a relaxing time with my husband and two kids. I love the flamingo one!! I would use it for my summer vacation! I’d fill it with all pool/beach essentials for baby…they require a lot so this tote would be perfection!!! Goldfish, pirates booty, enough to entertain a 1 and a three year old all day and prosecco for mama!!! I would love to win a bag! Perfect for my new baby! I feel like I pack for trips in totes so this would be my summer trip tote! Bring on the fun in the sun! 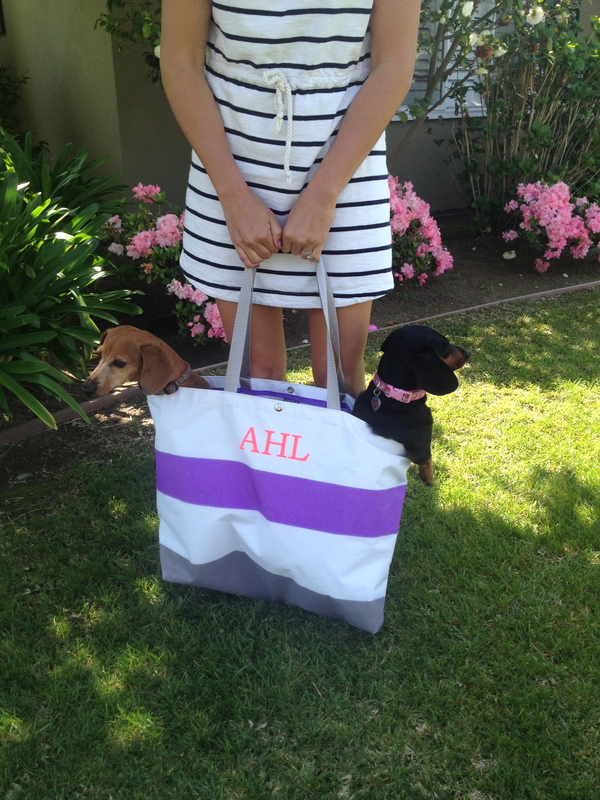 My favorite ditty tote is the Lilac and teal tote, i might put my dachshund in it but i would definitely put sunscreen, iPad, cell phone, towels, wallet, my supplies to check my blood sugar and whatever else i could fit to go to the beach. I would totally put the beach towels and toys along with snacks in. I love that purple and gray one! All of our things needed for our 11 month old and our 7 year old. I hate having to carry so many different bags just to go somewhere! This bag looks awesome and I need it. I have a 2 year old and one on the way. I could fit everything I need for them in there. I would use while traveling, for the beach/pool and to take all of our library books back! I have been eyeing up the seahorse tote for the past few weeks.. It’s amazing!! And monogrammed.. Umm yes! I will be using it for boating and the lake! As well as probably an everyday use since it’s just gorgeous! Completely obsessed! Was so excited to see this giveaway! We are spending the week at the beach this summer and I would use it then and I think it would make me smile using it for work as well. I love the Galapagos Green and Bora Bora Blue bag. Perfect for trips to the pool and beach this summer!!! One can never have too many bags! 😉 Love the flamingo tote. We would fill it with towels, sunscreen, and other pool essentials! I am a bag lady!!!! We are always at the lake or the pool, everything from snacks, sunscreen and our Yorkie would fit in. I adore the flamingo bag. Fingers crossed, I’d love to win…but who wouldn’t. Love these bags! Thanks for sharing! And I would totes tote it to the pool w/ ALL the kids’ goodies! I need a new beach bag and these a super cute. Thanks for the giveaway. I would love to win! These make perfect pool bags!! Love the look book and there are so many great choices, leaning towards the anchor, pink & orange or lilac & gray. Thanks for the introduction, these bags are everything! I love the flamingo bag and would pack it full of all the summer and pool essentials. Plenty of room for the 25 hot wheel cars we need to roll everywhere with! Perfect for my summer baby/pool/beach bag! Love! These bags are SO cute. It’d be perfect for our trip to the lake this summer. Not only could it hold all of our items for the beach, but it can even hold the water bowl for the puppy and his favorite toy. 🙂 A crowd-pleaser for everyone! those are such cute beach bags and perfect to take to Disney soon! I have been eying this bag up for quite some time now.I love it! I would use this as a beach bag…since I am in the market for a new beach bag…BIG TIME! I would stock it with mine and my hunni’s beach towel, sunscreen, oil, the current book i’m reading, sunnies,cover-up, water, beach snacks…and whatever else my mind can think of! I gave one of these bags to my daughter’s teacher and it was just perfect. Now I need one for our summer adventure! Would love one for beach and cabin trips! It would be perfect for all our essentials (potty seat, pickles the (stuffed) cat, lemonade)! I love this bag! I would probably pack it with everything but the kitchen sink when we take our daughter to the beach! You can ever have too many totes! Love the ditty tote! What wouldn’t I put in this bag?! Beach towels and gear for the fam, an overnight bag, quick trip to the grocery…the possibilities are endless!! I love the BERMUDA PINK & OAHU ORANGE ZIPPER TOTE and would fill it with my towel, book, sunscreen, and water for the pool! I love the BERMUDA PINK & OAHU ORANGE ZIPPER TOTE and would fill it with my towel, book, sunscreen and water for the pool! And, I’ll load it with pool gear because I plan to spend many lazy days by the pool this summer! I love the lobster one! I love these tote bags! I’m loving the BERMUDA PINK & OAHU ORANGE ZIPPER TOTE for my upcoming honeymoon!! Would be the perfect carry-on and beach bag for our special trip! We would stuff that sucker full of snacks galore and pool gear, b/c what is a pool trip without 400 snacks?!?! Love the teal and white with the flamingo or any of them 🙂 would stuff it with towels,snacks, my BKR water bottle, iPad, iPhone,sunscreen, sunnies and my wet brush! Thanks for a awesome giveaway you are too sweet!! Love the Ditty tote!! Would be perfect for the beach, pool and lake!! Flamingos are my favorite and these bag would be perfect!! We plan on living at the pool this year and this bag would come in handy with two little girls! Would love this bag for our pool trips! I’ve been obsessed with the grey & purple dirty but the flamingo bag might be a new contender! I’d fill it with all of my beach essentials for the fam this summer!! Presh bags! Would love to win one! Living in Florida, I would get a lot of use out of this bag on our frequent trips to the beach. I love that this is large enough to fit everything we need. I love Reagan’s bag! Great for a short weeekend trip. I would love the blue and teal tote! I would use it as a baby bag for my 2 little that are 18 months apart and require lots of things to carry!! I love the flamingo bag. It would be perfect for all my necessities for a day on the boat! I graduated from the university of mississippi in May and just accepted my first job as a second grade teacher! I will use this bag to carry all of the papers I will grade, lesson plans, and tons of books! I love the black and white! I would fill it with towels, snacks and a good book for a relaxing pool day!! Love the black and white! I would fill it with monogrammed towels, snack and glossy magazines for an epic pool day!!! Love these bags! Would love to win one! These are so cute! I would put all my kids’ pool stuff in it! So loving these, especially the one with Reagan’s initials and the flamingo! I would use this as a diaper bag to accommodate my twins 8 month old girls and my 2 year old little boy!! I love these totes! And could use one for the pool and beach this summer! I would DIE for the grey and pink one to take to the beach in Costa Rica this summer! I would obviously fill it with wine and candy…the basic beach essentials. Definitely need for all the kids summer things! The black and white is cute! I love all of the bright colors! These bags would be perfect for the beach or pool! Love these bags! I always have a ton to haul to the pool each day! This bag is big enough to fit it all, but still very manageable! The bag I currently have is a great size, but it’s oddly shaped and difficult to manage. Would love the flamingo ditty for all our pool toys/towels and fun stuff! So Cute! i live in Fort lauderdale and this bag would add a super cute staple to my beach trips!!! Would love to win a tote bag!! I love these totes-they would be perfect for the summer!! Oh how I would love to win one of these bags!! Our weekend pool trips would be a bit less stressful with a bag big enough to carry our things! Functional and cute, what more can you ask for!?! I love the classic black and white stripe. I would use it as my book bag and gym bag for school this summer! The Grey & Pink calls my name. I would use Tito haul all things pool. I love these totes! My Australian Shepherds go to agility and obedience classes every week so this tote would be awesome to carry all their stuff in-leashes, towel, food, water, bowls, toys, etc. Love, love, love! These bags look amazing! Would love a bag in any color for pool trips this summer!!! I LOVE these bags!!!! They are all so cute. If i had one I would keep my husband and my stuff for the beach and water parks to use all summer!! (and fall…and basically all year since we live in Florida-hehe!!) It would be hard to pick which one since they’re all adorable!! Would love the large pink and white striped one to all of mine and the kiddos pool stuff in!! Such cute and preppy bags!!! You can never have enough bags!!! I would LOVE this! FLamingo for my sweet girl or the lilac and gray for me 😉 Towels, books, water and snackies for the summer! Thanks Ashley!! I love the Royal Blue and Siesta White Sand Zipper. So chic! This tote would be perfect to haul all of our gear for our family of 6 to the pool!! I love the seahorse version but since I’d be using it for quilting supplies, I’d probably pick the gray/pink stripe or the blue/green stripe. Thanks! These bags are just perfect for carrying anything! love all the fun bright colors! MY favorite tote is the galapagos green and bora bora blue! OMG I Would fill it with all the summer necessities: monogrammed beach towel, sun hat, lib balm, snu tan oil, and delicious adult beverages 🙂 These totes are divine! Books, towel, water, sunscreen – perfect pool bag! I would love to have one of these totes! It would be perfect to take on our weekend trips to the Lake of the Ozarks 🙂 I have to pack multiple bags when we head out on the boat for the day, so it would be so nice to have one bag that would fit everything! I love the bag Reagan is in 🙂 We are going to the beach in july and with a family of 5 I’m thinking this bag will be awesome!! I would love the flamingo tote! I would use it like crazy at the pool and the beach!! I would use it to take to the pool! also as a carry on for our family trips! I would love to use this for the pool and summer trips! Such a cute bag! always need a good pool tote. I love this bag and I love your cute little family! The perfect bag for the summer and big enough to carry supplies for my three boys too! I love the anchor bag! I like the black and white striped one, and I would put all of my three kid’s summer essentials in there!love the bags! Need this for the pool this summer! Lucky Lagoon! I would pack my Nook, daily life planner, snacks, and books into this tote…even a pair of wellies and a scarf based on the weather. I would love this tote and would stuff that thing with goodies for the beach….totes Magotes!! I love that fact that you can just hose it down…perfect! I love these totes-they would be perfect for the summer! This bag is so cute. i could fit everythng we need to go on the boat at the lake. I LOVE the “Let’s Go Fishing” tote! This would be the perfect tote for me to lug to my lifeguarding and swim teaching job on the weekends, I usually use one of those reusable store bags but they fall apart so fast! Thanks for having this giveaway Ashley! These bags look amazing! I would LOVE to have one! Ahhh! I need one of these!! I am officially obsessed with that flamingo tote. So cute! LOVE THESE! I would love one for all the pool and beach goodies! I do like this bag and need a new pool bag! I NEED that adorable flamingo tote!! My favorite is the navy and yellow stripe bag. It would be perfect for my upcoming trip to orange beach, AL with my family. These are so cute! I love your blog. I have two year old twin boys. We love the pool, the beach, and to go, go, go in general. One of these totes would make me feel cute and they seem so practical! Love them! I would want the lilac and teal. It would be filled with my family’s pool essentials!! I would love the royal blue and siesta sand white zipper ditty!! It is a perfect bag for the pool and beach for towels, sunscreen, thermoses, changes of clothes, diapers, etc. That “Riviera Red & Oahu Orange Zipper Tote”. I can’t even!!! So pretty! I would fill it with my foam roller and water bottle on gym days, Mimosas and a beach towel on Sunday Fundays, and basically anything bc it’s fab. <3 Thank you for doing this giveaway and every giveaway. You're so kind! Have a great day with Mr. Fancy and the little presidents! I love the seahorse bag! No doubt I would find many uses for it, but would definitely use it while on our beach vaca to carry things from the condo to beach. LOVE the Yucatan yellow and Bora Bora blue! What would I put in it??? What wouldn’t I put in it?!?!?! Thank you for this opportunity!! What an awesome gift this would be! Love the Tote!!! It is a must have! Hope I win! I love the monogrammed stripes! I would fill the bag with baby essentials… I have a one year old and another on the way! omg would love one of these totes after being at our pool all weekend i now know I need a new one! thanks girl love your blog! I would totally use this at my lake/ beach bag! I love the large tote! I would use it for the beach and pool! I adore the ditty, but I’d love the Middy for something to carry around every day. I love them all and the accessories! Reagan looks adorable. Summer beach essentials and adult beverages and books!!! The tote is so roomy, I could slip my Maltese puppy inside and head off to the park! The tote is so roomy, I could slip my Maltese inside and head to the park! I love the palm beach tote!! I would put all my work supplies in it! This tote is great and would be filled with our summer entertainment! This would be perfect for the pool or on vacation! Love the Lilac & Gray. I’d use this bag as an everyday tote for my work stuff. I wold love love love the GASPARILLA GRAY & BERMUDA PINK ZIPPER TOTE! I would use it this summer while travelling! We have 7 wedding to go to/be in and this would be the perfect carry on bag to fly with! Those are perfect! I need a tote like that for nannying. We have to carry around six stuffed animals, a blanket, and two baby dolls. I’m loving the Capri or Bermuda Pink and Oahu Orange totes — too cute! we have several trips planned this summer (and one to the beach), so I know I would fill it with my ipad and other travel necessities (snacks, chargers, magazines, etc.) Thanks for hosting such a fab giveaway!! I would definitely use this for the beach and pool because that bag can never be large enough! This tote is perfection! I stuff my current tote to max capacity, and still have to carry beach towels separately. With two kiddos, it’s unbelievable how much I have to carry to the pool/beach! Bags are my weakness & monogrammed to boot! My daughter is obsessed with Flamingos, so I’d HAVE to go with that one for her! I’m a teacher, so I get to stay at home with her in the summer & it’d be perfect for all of our adventures! I would love one!!! We are traveling to the beach with a two year old so i need a huge bag to lug all of his stuff down to the sand!! I love the capri!!!! Thank you for the amazing giveaway! I want one of these bags so bad!! I LOVE my flamingo ditty tote but I think all of the nautical ones are so cute too, especially the anchor! in LOVE with the Flamingo! Perfect for a couple towels, a book, and some snacks for a day at the beach or pool! OOOOH! I would totally love to take one of these beauties with me on my honeymoon in July! We’re going to be spending lots of time at the beach and traveling, so it would be delightful to stock this tote full of snacks, towels, clothes, and everything else we need to enjoy our honeymoon in San Diego! I love the lets go fishing tote – I’d fill it full of pool gear for my 3 boys! I am a nanny for two fabulous little kids in The middle of Nebraska. This beautiful tote would be perfect for days at the pool and the lake! I would be thrilled to death to win one!! I would stuff it full of snacks, water, towels, flip flops, sunglasses, and you can not forget the sunscreen!!! Love these sailcloth bags and their beautiful designs. I would use them to tote our pool necessities for 2 little men and a little lady, joining our family in August. Thanks for the giveaway! The flamingo one! I’m sure the possibilties are endless of what to stuff in that thing.. Need! I would love to win a tote! I am not familiar with this store but will definitely check the site out. I really like the flamingo tote. It would be perfect for Florida as it seems the flamingo is the state bird. Thanks! I would fill it with snacks and other goodies for my upcoming road trip! Love the fun colors and especially love the flamingo 🙂 Reagan has such good taste! I would love to use it as an overnight bag and a travel bag! It looks like the perfect size to hold everything for a girls night sleepover! Would love to pack it full of gear for swim lessons and other day trips this summer! Flamingo in pink. I would fill it with towels, sun screen, flip flops, sunglasses and sugar SPF lip gloss. Thanks fancy Ashley!!! So cute! I especially love the pic of Reagan in the bag! I’d love to win! I love the seahorse and would use it to carry our beach towels and water park necessities this summer! Such a great giveaway!! Especially since it’s summer season!! I’d put a little of everything in there, I believe! Every morning I”m carrying a crazy amount of stuff to my car – my work bag, lunchbox, gym bag, purse, etc. this bag would be perfect for hauling all of it so nothing gets left behind! Love love love this tote!! would be perfect for beach trips all summer! the flamingo is my fave! but the whale one is wonderful too!! 🙂 perfect bag for college!! love me some tote bags! These look like the perfect bag! Would love one to tote around my fam’s necessities in! I LOVE LOVE LOVE this bag! I would use it to bring on the beach this summer and fill it with towels, sunscreen, a good book, and snacks of course!! Love the look and durability of this bag!! All the things that could fit inside…the possibilities are endless!! I’m in love with the palm beach lately limited edition bag, but they are all so pretty how could you decide? living so close to the beach and having a summer house on a lake, bags like these are essential!! I would LOVE this tote!!!! on this web site and I think that your site is really interesting and has a lot of fantastic information.